This Afternoon... Sunny, with a high near 70. Breezy, with a southwest wind around 25 mph, with gusts as high as 37 mph. Tonight... Mostly clear, with a low around 43. 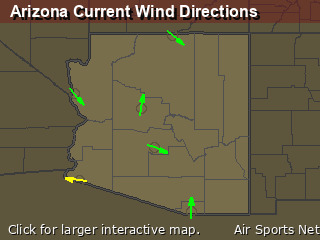 Southwest wind 11 to 18 mph, with gusts as high as 22 mph. Sunday... Sunny, with a high near 66. Breezy, with a south southwest wind 20 to 23 mph, with gusts as high as 36 mph. Sunday Night... Partly cloudy, with a low around 39. 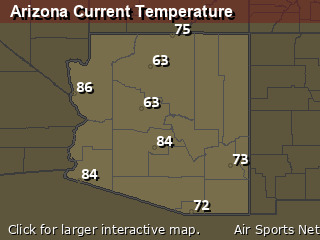 Southwest wind 6 to 13 mph. Monday... A 10 percent chance of showers and thunderstorms after 11am. Sunny, with a high near 64. South southwest wind 8 to 11 mph. Monday Night... A 10 percent chance of showers and thunderstorms. Partly cloudy, with a low around 39. Tuesday... A 40 percent chance of showers and thunderstorms. Partly sunny, with a high near 65. Tuesday Night... A 20 percent chance of showers and thunderstorms before 11pm. Partly cloudy, with a low around 40. Wednesday... A 20 percent chance of showers after 11am. Mostly sunny, with a high near 70.